The AT&T Center has updated it's logo on the Spurs' court and throughout the arena as well. That damn one helmet rule ruined what was probably my favorite NFL throwback uni (the other being the Cowboys' white and blue). But this is a nice compromise. I really like the socks. Color Rush should be two teams both wearing colored jerseys. Having one team in all-white every week just makes the whole Color Rush concept seem stupid. If this is what the NFL wants then they should've planned their Thursday night games better by not having teams with the same colored Color Rush uniforms play each other. Just my two cents. Incarnate Word (FCS) going all-red at home this weekend against McNeese. 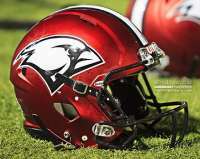 Incarnate Word (FCS) going red/white/red on the road this week against Nicholls St.
"Fighters" is such an awesome team name. I agree with you 100%. I'm actually in favor of them scrapping the navy pants. Navy on white and white on light blue should be their standard home and away looks. Florida's white helmet would look a lot better if the stripe matched the pant stripe. I agree. The Titans should only wear navy on white and light blue on white at home, and white on light blue and all white on the road. I've never been a fan of block number fonts where the 2 slants downward in the middle. Just looks weird to me for some reason. Abilene Christian's new Nike road uniform is featured on their 2016 football poster. Their five-year deal with Nike began on July 1. I really hate that number font. I agree. The black outlines in their current uniform really makes everything pop out a lot better. If you change the black facemask back to blue it would be perfect. 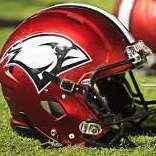 Incarnate Word (FCS) will be wearing new matte red helmets this year. I want the Spurs to go back to the round collar and add back the waistband trim on their shorts. Also, I would love to see them bring back their 70's ABA grey & black uniforms as full time alternates to replace the ones with the huge Spur logo on the front.